Are Duterte's multi-million-peso intel funds achieving their purpose? Confidential and intelligence funds, by their nature, are difficult to audit. Given significant increases in level of spending on these items, should taxpayers simply trust that President Duterte is 'a good man'? President Duterte's intelligence and confidential funds alone are already 5 times bigger than the combined funds of the Office of the President (OP) received in 2016, the last budget enacted during the Aquino administration. Current spending levels are unprecedented. If the pattern holds – even if the Duterte administration merely retains the current spending levels in the succeeding years of his term – the Duterte administration will still spend during its entire 6-year term at least 4 times more for intelligence and confidential activities than the Aquino administration. Given their nature, confidential and intelligence funds are difficult to audit and have been abused in the past. Clear plans and expected outcomes are needed to evaluate spending levels against outcomes. MANILA, Philippines – In 2018, the Office of the President (OP) is once again expected to get a P2.5-billion allocation equally divided between confidential and intelligence funds. What this means, in effect, is that in just one year, President Rodrigo Duterte is allowed to spend 84% of the entire amount his predecessor was allowed to spend (P2.98 billion) for his entire 6-year term. In justifying the huge increase in these line items, the budget department said the funds will be used "mainly for President Rodrigo R. Duterte's war against drugs, criminality and corruption." Increased efforts in these areas on the part of the President, the department said, naturally requires an increase in resources. Critics questioned the big jump. Funds such as these, after all, had been subject to abuse in the past. In investigations into corruption within the armed forces in the past decade, former armed forces budget officer George Rabusa admitted that relaxed controls over intelligence funds made conversion of funds from other budgetary items possible. 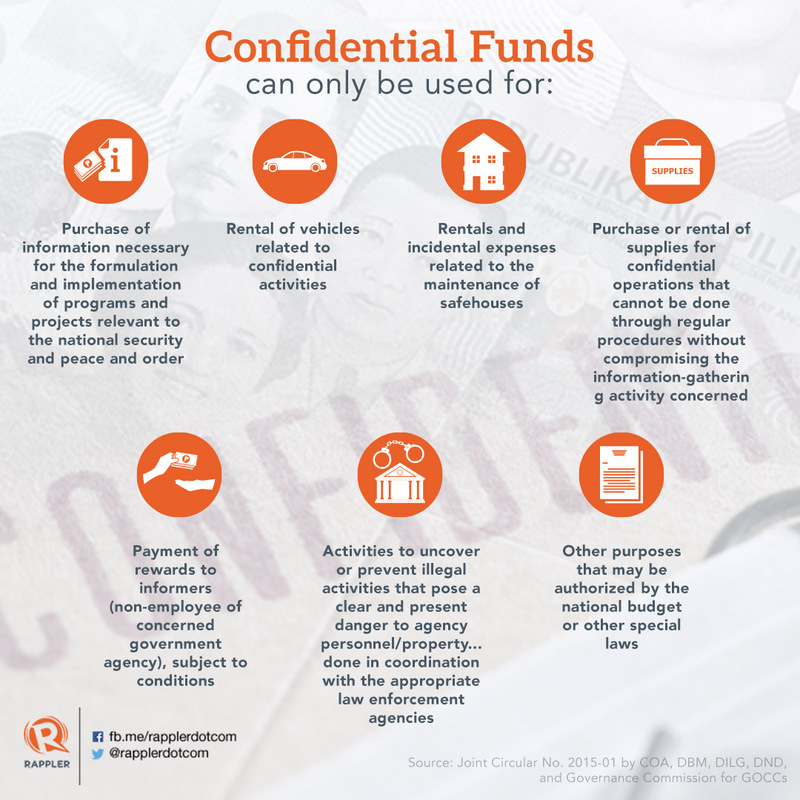 Unlike regular budget items, confidential and intelligence funds are liquidated using the sealed envelope system, making them difficult to audit. In a 2011 interview for the book, The Enemy Within, Newsbreak's book on military corruption, former Commission on Audit (COA) chair Guillermo Carague explained why. "We can't audit intel funds because they are used for espionage purposes," he pointed out. "How can you verify espionage?" PRONE TO ABUSE. Because they are difficult to audit, confidential and intelligence funds have been abused in the past, as shown in previous scandals in the military involving George Rabusa, Jacinto Ligot, and Carlos Garcia. Following major corruption scandals that related to the use of intelligence funds, some efforts were made to improve controls over their release and liquidation. In 2015, a joint circular governing use of these funds was inked between the Department of Budget and Management (DBM), Department of the Interior and Local Government (DILG), Department of National Defense (DND), the Commission on Audit (COA), and the Governance Commission for government-owned and controlled corporations (GOCC). The joint circular restricted the use of these funds for purposes identified below. 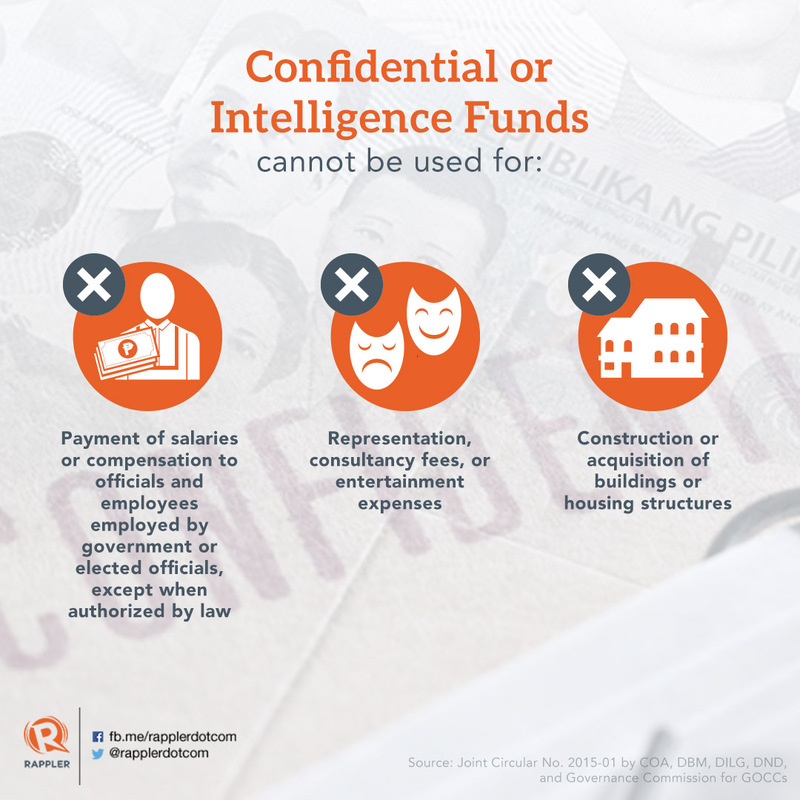 Still, by their very nature and their impact on national security, the specific uses of these funds are not disclosed to the public, said former COA chairperson Grace Pulido Tan. Auditors still have to rely on certifications by government agencies using their confidential and intel funds, since receipts are not always expected for many expenses charged against these funds. When Rappler asked him about this in an interview, Budget Secretary Benjamin Diokno asked citizens to put their trust in Duterte. "We just have to trust him na mabuting tao siya (that he is a good person)," he said. Diokno made that statement about the Duterte administration's intel and confidential funds over a year ago, when the war on drugs was just starting to gain steam. Now, as Duterte sought another extension of his self-imposed deadline on the eradication of illegal drugs in the country, questions mount over whether the significant increase in funds for intelligence and confidential expenses has achieved its objectives. Why put intel funds under OP? A big question that needs to be answered is whether it makes sense to put the funds under the Office of the President, considering that the OP is not a unit primarily responsible for intelligence outcomes. Senator Antonio Trillanes IV earlier raised concerns over the capacity of the OP to manage such a huge increase in confidential and intel funds. Ideally, a budget department insider said, these funds should go to the line agencies which are accountable for intelligence operations outcomes. "The President should not have that. Or it should be minimal as possible." 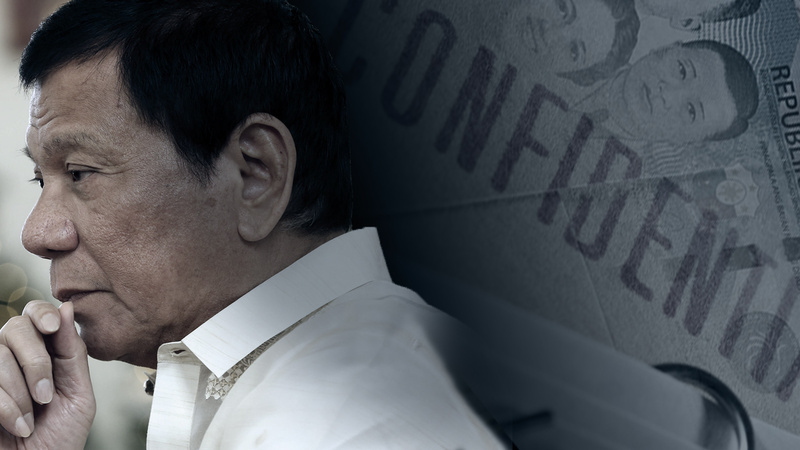 Post-Martial Law, intel and confidential funds allocation under the OP first got a significant boost during the time of former president Joseph Estrada, when he created the Presidential Anti-Organized Crime Task Force (PAOCTF). Diokno, incidentally, was also Estrada's budget secretary. Since then, despite the much reduced role of the PAOCTF and anti-crime offices under the OP, the funds remained under the President's office. BUDGET BOOST. Budget Secretary Benjamin Diokno also happens to be the budget secretary during the time of former president Joseph Estrada, the last time the OP got a significant boost in confidential and intel funds. Key security sector and crime enforcement agencies, however, have no reason to complain as they have their own share in the intel and confidential funds boost. The PDEA was not given any intelligence funds. But its confidential funds almost tripled from P73.6 million in 2016 to P203.6 million in 2017 and 2018. The PNP got P469 million in 2017, or 53% higher than its 2016 budget. For 2018, however, its proposed intelligence funds will jump to P969 million – 3 times higher than its allocation in 2016, the last budget of the Aquino administration. The defense establishment's intel funds got a 518% boost (P1.646 billion) in 2017 from P266.4 million in 2016. For 2018, this will increase by another 13.7% to P1.87 billion. Note that this is on top of increases for other budget line items in these agencies. Overall, the PNP will get a total budget of P132.31 billion in 2018, from P111.62 billion in 2017 and P88.51 billion in 2016. The AFP will also be allocated a budget of P143.96 billion in 2018, an increase from P132.89 billion in 2017 and P113.21 billion in 2016. The graphs below show how confidential and intelligence funds for these agencies compare with other agencies of government since 2012, the earliest available year when confidential and intelligence funds were broken down in budget documents. As of 2017, confidential and intelligence funds for the country's armed forces is at least 6 times higher than the levels during the Aquino administration. Receiving the increases are the Philippine Army and the General Headquarters (HQ) of the Armed Forces of the Philippines (AFP). The Army's intelligence funds had jumped from P64 million in 2016 to P444 million in 2017. It will get the same amount in 2018. Meanwhile, AFP HQ had received P1 billion more in intel funds, from P140 million in 2016 to P1.14 billion in 2017. 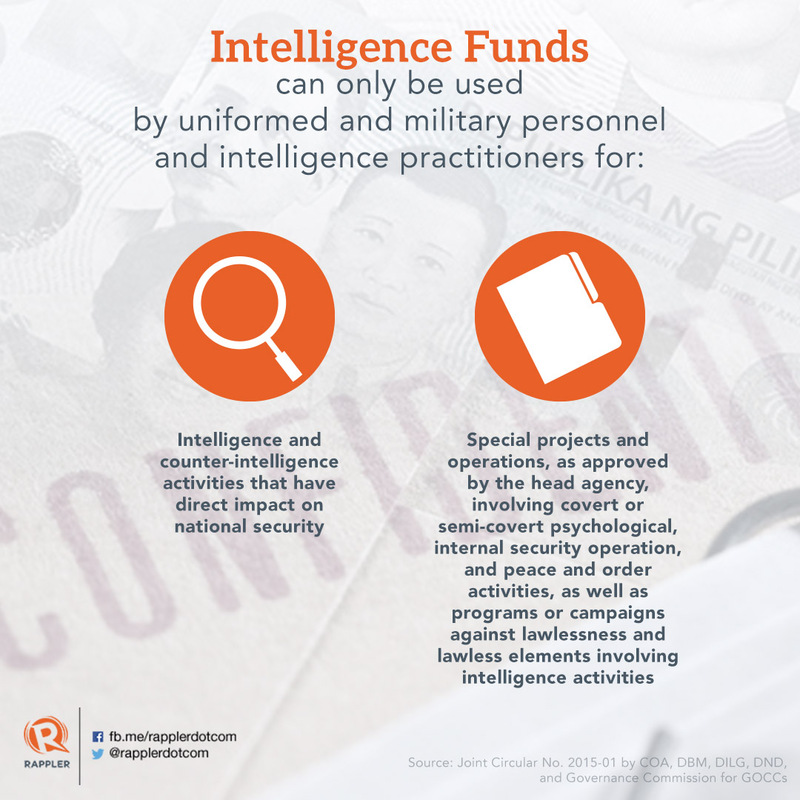 It will get P1.36 billion in intelligence funds in 2018. Intel funds for the Philippine Air Force and the Philippine Navy have remained the same. The Philippine Drug Enforcement Agency (PDEA) is the agency mandated by law to implement the efficient and effective implementation of the national drug control strategy. Under the law, PDEA is tasked, among others, to "monitor and, if warranted by circumstances, inspect all air cargo packages, parcels and mails in the central post office, in coordination with the Philippine Postal Office and the Bureau of Customs." It is also supposed to "conduct eradication programs to destroy wild or illegally grown plants from which dangerous drugs may be extracted." In addition, it is mandated to "establish and maintain a national drug intelligence system" in cooperation with agencies "that will assist in the apprehension of big-time drug lords" as well as establish "close coordination, cooperation and linkages with international drug control and administration agencies and organizations." When Duterte assumed office, PDEA was the lead agency in the drug war – on paper. But it was the PNP that grabbed the spotlight in the first months, becoming the face of the administration's anti-drug efforts. 'WAR ON DRUGS.' In this file photo, President Duterte confers with PNP chief Ronald dela Rosa. Criticism over the PNP's bloody approach to the war initially forced the President to pull out the PNP and name the PDEA as the sole agency in charge of his "war on drugs" in October 2017. This was short-lived, however. In early December 2017, the President brought the PNP back into the anti-drug operations, with PDEA retaining the lead role. Tokhang, the administration's main strategy to combat the drug menace, largely involved asking barangay leaders to submit lists of supposed drug pushers and drug addicts in their communities and literally knock on the doors of suspects. Tokhang has a separate budget (amounting to P900 million) from the PNP's confidential and intelligence funds. With PDEA taking the lead in the drug war, the House and the Senate decided to realign the said funds to housing projects for the police and the military. Apart from the PNP's door-to-door approach, the Department of the Interior and Local Government (DILG) had also tried to implement "drop boxes" in barangays. Reports and feedback made through these "drop boxes" would supposedly help in battling criminality and drugs, but some residents fear it would lead to false information. The DILG eventually promised the Senate in October to "drop" the idea of drop boxes. These methods reflect a focus on street-level rather than big-time drug trafficking operations. Critics note that they have also resulted in many innocents becoming regarded as collateral damage.